Monday January 16th 1922 Was in bed most of the day. The girls went to a party and to a birthday party for Mr Read (the minister) and them to The Englert to see "Aphrodite." Edwin came in early. I was reading. 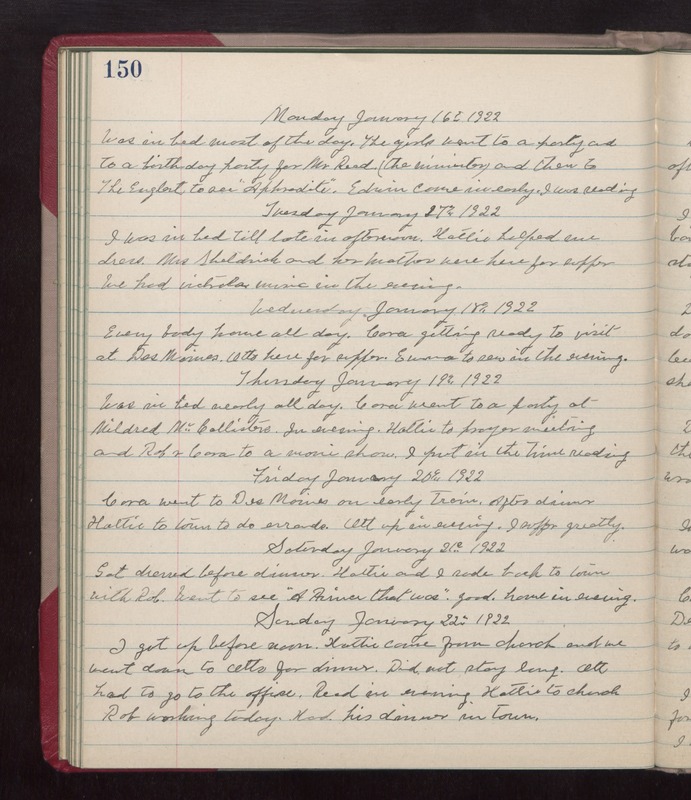 Tuesday January 17th 1922 I was in bed till late in afternoon. Hattie helped me dress. Mrs Sheldrick and her Mother were here for supper. We had Victrola music in the evening. Wednesday January 18th 1922 Every body home all day. Cora getting ready to visit at Des Moines. Otto here for supper. Emma to sew in the evening. Thursday January 19th 1922 Was in bed nearly all day. Cora went to a party at Mildred McCallisters. In evening Hattie to prayer meeting and Rob & Cora to a movie show. I put in the time reading Friday January 20th 1922 Cora went to Des Moines on early trail. After dinner Hattie to town to do errands. Ott up in evening. I suffer greatly. Saturday January 21st 1922 Got dressed before dinner. Hattie and I rode back to town with Rob. Went to see "A Prince that was." Good. Home in evening. Sunday January 22nd 1922 I got up before noon. Hattie came from church and we went down to Otts for dinner. Did not stay long. Ott had to get to the office. Read in evening. Hattie to church. Rob working today. Had his dinner in town.